The representative of the Soviet avant-garde in painting, Pavel Filonov – a mysterious and ambiguous figure. The artist spent most of his life in Leningrad, where he fanatically created unique masterpieces until his death during the blockade. He lived modestly, sometimes even in extreme need, which made him forget about personal preferences in art themes and take on government orders. One of such works is a canvas with the image of I. V. Stalin in 1936 commissioned by the Sailors’ Club. 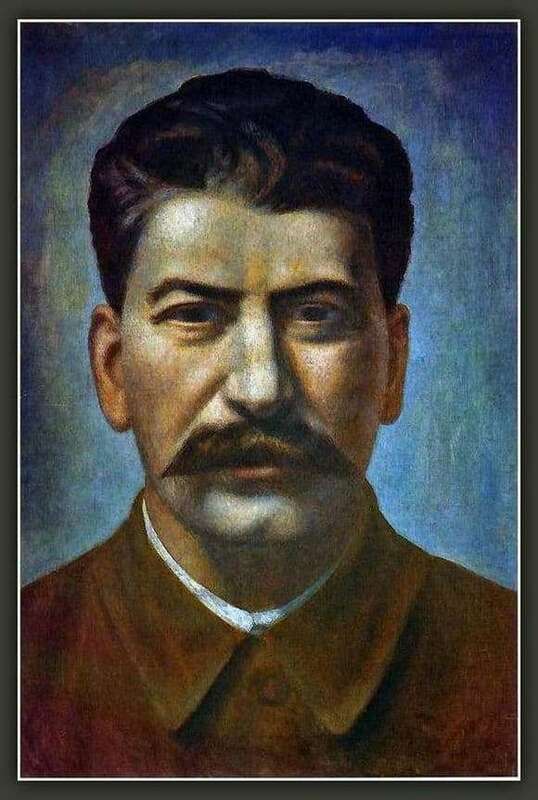 Although the government order had to abandon the main direction that inspired the artist, who combined the features of expressionism, fauvism, cubism and futurism, in one word, the avant-garde, “Stalin’s Portrait” still has a deep content inherent to Filonov’s canvases, despite the style socialist realism. Before us is a portrait of a young man. His face seems to be somehow wooden, the conical shape of the skull is covered with thick black hair, his forehead is narrow, his eyes are surrounded by swollen eyelids, a thin line of lips is covered with large trimmed mustaches. He is dressed very neatly: in a military coat, through which a white collar of a shirt peeks. The figure is depicted on a cold bluish background. What is most striking is the eyes of a man: big and black, they are looking ahead confidently, without a single hesitation. Surrenders, some impenetrable darkness stared at us, menacing and ferocious. In the guise of Joseph Vissarionovich guessed determination and inflexibility. What decision he made this time and prepares for execution? The guesses repel and scare. Soldier calmness and deadly cunning completes the characterization of the portrait. Pavel Filonov carefully preserved his creative heritage, refusing to sell abroad, so that now everyone could see the masterpieces of painting in the St. Petersburg Russian Museum.